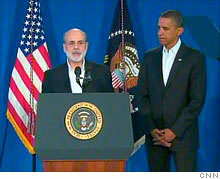 Obama says he will nominate Ben Bernanke to lead Federal Reserve for another 4 years. Ben Bernanke is named for a second term as Fed chairman. Should Ben Bernanke be reconfirmed for a second term as Fed chairman? WASHINGTON (CNNMoney.com) -- President Obama announced Tuesday that he plans to nominate Ben Bernanke to a second term as head of the Federal Reserve. "Ben Bernanke, has led the Fed through the one of the worst financial crises that this nation and this world have ever faced," Obama said from Martha's Vineyard, Mass., as Bernanke stood by his side. "As an expert on the causes of the Great Depression, I'm sure Ben never imagined that he would be part of a team responsible for preventing another." Bernanke has played a central role in the government's extraordinary response to the recession and 2008 banking panic. Obama said that Bernanke's "background, temperament, his courage, and his creativity" helped him to prevent another Great Depression. The renomination of Bernanke, a Republican, will go before the Senate for a vote before his term ends on Jan. 31. Fed chairmen serve four-year terms. Most observers said Tuesday they expected that he would be confirmed. The question of Bernanke's reappointment had been the focus of much speculation since Obama's election last fall. Recently, many economists and insiders had said they believed that he would more than likely keep his job. The Fed has drawn criticism for not taking a stronger hand earlier in the crisis and for their part in inflating the housing bubble by keeping interest rates low for so long. "The Federal Reserve like other economic policymakers has been challenged by the unprecedented events of the past few years," Bernanke said Tuesday. "We have been bold or deliberate as the circumstances demanded, but our objective remains constant to restore a more stable financial, and economic environment in which opportunity can again flourish and Americans' hard work and creativity can receive their proper rewards." The Fed is charged with examining bank soundness, as well as checking the cost and availability of money and credit in the economy. Given the more than $1 trillion the Fed has printed to get the credit markets moving, there's a renewed focus on watching for signs of inflation. Over the past three decades, the country has had only three Fed chairmen. New presidents have tended to keep Fed chiefs in place regardless of political party to maintain continuity in monetary policy and confidence in the markets. Paul Volcker was appointed by President Carter in 1979 and retained by President Reagan. Alan Greenspan, a 1987 Reagan appointee, served under four presidents including President Clinton. Bernanke, 55, was appointed to the top job in 2006 by President George W. Bush, after serving as Bush's chair of the Council of Economic Advisers. An expert on the Great Depression, Bernanke previously chaired the economics department at Princeton University. He also did a three-year stint on the Fed's board of governors ending in 2005. On Tuesday, Obama praised the Fed chairman and made it clear he wants him to be a part of the team that strengthens financial regulation to prevent future crises. "We have already seen how lax enforcement and weak regulation can lead to enormous wealth for a few and enormous pain for everyone else," Obama said. "And that's why even though there is some resistance on Wall Street from those who prefer things the way they are, we will pass the reforms necessary to protect consumers, investors, and the entire financial system." Obama also said that the expected change ahead would come with "debate and disagreement and resistance from those who prefer the status quo." That debate is likely to play out in the Senate, which has bumped heads with Bernanke over the past several months. Sen. Chris Dodd, D-Conn., chairman of the Senate Banking Committee, said in a statement Monday night that he supported Bernanke's nomination as the "right choice," but he noted that he has had "serious differences" with the Fed under Bernanke's tenure. "Chairman Bernanke was too slow to act during the early stages of the foreclosure crisis, but he ultimately demonstrated effective leadership and his reappointment sends the right signal to the markets," Dodd said in a statement. Dodd said he expected that lawmakers would raise "many serious questions" about the Fed's role and authority. While Bernanke's confirmation hearing promises to be interesting, he is likely to be confirmed. Even some Republicans who are often Fed critics, like Sen. Bob Corker, R-Tenn., praised Bernanke's second term on Tuesday. But Senate Minority Leader Mitch McConnell made it clear Republicans plan to engage in a healthy debate at Bernanke's confirmation hearing. The hearing "will be an opportunity for the chairman to provide greater transparency on the actions the Fed has taken, and greater insight into the cumulative impact the administration's trillions in new spending, borrowing, and debt will have on the American taxpayer," McConnell said in a statement. One frequent critic of the Fed went further. Sen. Jim Bunning, R-Ky., said he was disappointed by Bernanke's reappointment. "This is just more evidence that the president has no clue what he is doing when it comes to the economy and solving America's fiscal problems," Bunning said. "Chairman Bernanke is part of the problem, not the solution." Overall, veteran Fed watchers say Bernanke's reappointment is a positive development. "I think, obviously, there are those who have concerns and criticisms, but the president's reappointing him is a strong vote of confidence," said Scott Talbot of the Financial Services Roundtable, a business lobbying group that approves of the reappointment. Alice Rivlin, who served as White House budget director in the Clinton administration and later vice chairwoman of the Fed, said she was pleased but not surprised by Tuesday's announcement. "It's the right thing for the president to do, because he's done a very good job, the best job that could have been done during these horrendous economic times," said Rivlin, who directs the Greater Washington Research project at the Brookings Institution. "It would have been hard to find someone better."